A pump manufacturer was designing an automated test stand to ensure their product performed to specification before shipment. They were seeking a high cycle valve that would be able to handle hundreds of cycles per day. Assured Automation was contacted to help find a valve that would meet the requirements for the water lines on a low pressure and a high pressure test stand. The low pressure test system operated at 100 psi and the high pressure system, 400 psi. Assured Automation proposed the VA valve and VAX valve for these applications. 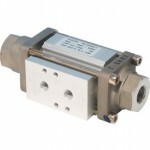 The VA valve is a fast acting, high cycle valve that can handle pressures up to 150psi. The compact design is ideal for the tight piping layout of the test stand. The low cost of the VA made it the right choice for the numerous valves required on the low pressure test stands. The VA Series is available in brass with NPT or Metric threads, 3/8” to 2”, vacuum to 150psi. The VA is pneumatically actuated. The VAX is also a fast acting, high cycle valve, but can handle much higher pressures-up to 600 psi. This solved the requirement for the high pressure pump stand. The VAX Series is available with brass or stainless wetted parts, NPT threads, 3/8” to 1”, vacuum to 600psi. Pneumatic or all Electric designs are available. Both valves lasted over a million cycles and were an ideal choice for this customer. Configure your VA Series or VAX Series Today! Marketing administrator at Assured Automation, a leading provider of automated valves and flow components for industrial process control applications. For over 30 years Assured Automation has provided state of the art automation to a diverse clientele ranging from small equipment manufacturers to Fortune 500 Manufacturing, Chemical and Pharmaceutical companies. 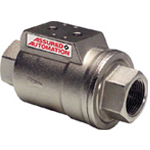 The Assured Automation product line consists of a complete offering of standardized automated valve assemblies with a variety of commonly used accessory items. In addition, we offer complete valve automation services where we supply special automated valve assemblies designed around your specified products or your particular applications. Full design capabilities are offered including AutoCAD, Solidworks or other commonly used design and drawing programs. In addition to standard products, Assured Automation develops customized solutions for specific customer challenges. You can find Kim O'Neill on Google+ and LinkedIn. This entry was posted in Latest News and tagged Pump Test Stands, VA Series, VAX Series. Bookmark the permalink. © Assured Automation. We reserve the right to make technical changes at any time. Please contact us to verify any information that is critical to your application.